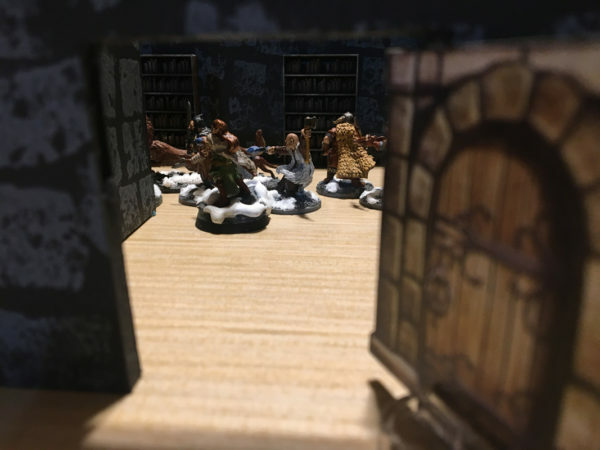 As I’ve been discussing off and on over the last few weeks, our Frostgrave bands were set to explore a vast underground library. 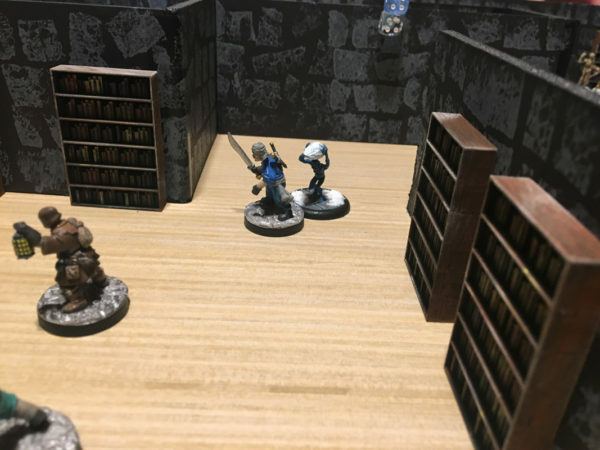 This scenario is actually a slight variation of the core rules “The Library” with a mix of “A Haunted House.” I wanted to get in some fun monsters and the Wraiths served well as ancient librarians trying to keep their sanctuary free from plunder. 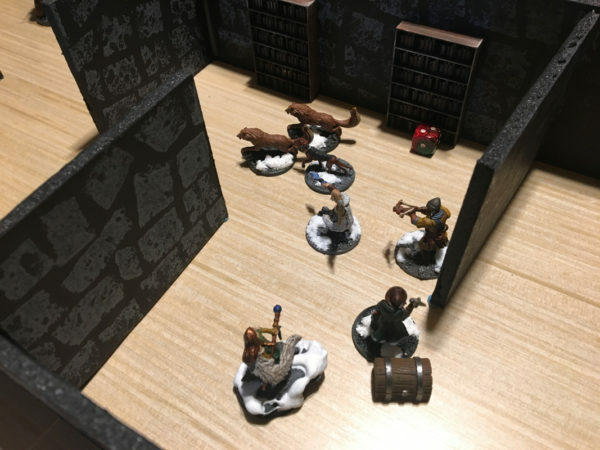 We had four players for session 2, all entering from four sides of the map through each of their own doorways. 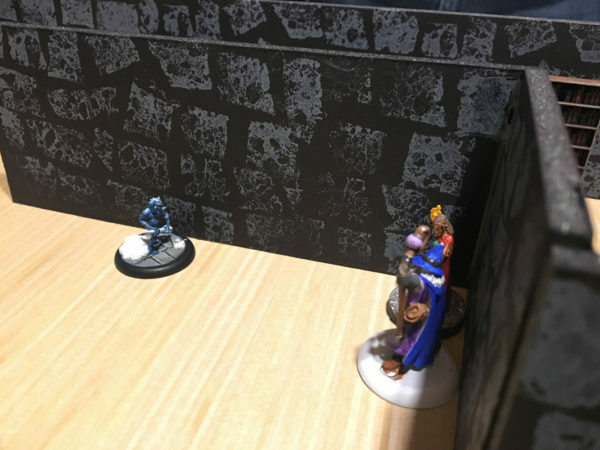 The specific scenario rules we made up for this battle was wraiths did not need line of sight, they just “felt” your presence from 10″ away. Normal-sized figures could climb the walls but not stay at the top. This was to be a large underground maze so the walls were almost to the ceiling. No teleporting or leaping over. We would play for seven straight rounds. 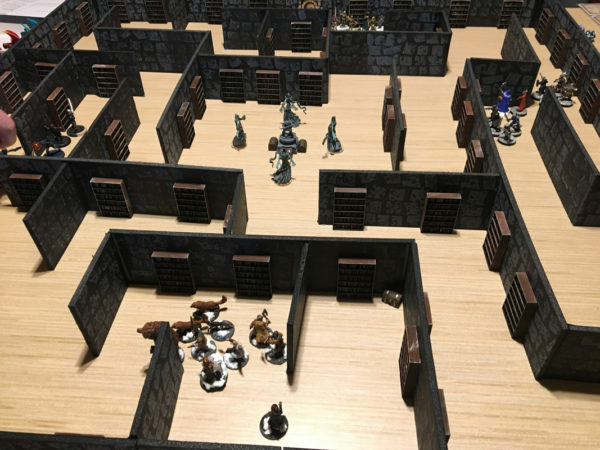 Anyone not at the door by the end would be lost in the maze and would need to make a Will roll (target 11) to make it out safely. 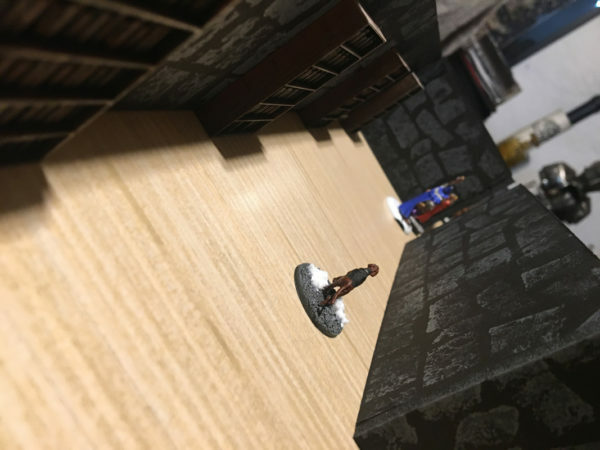 I consolidated my forces in the entry with a lone thief in the back to grab the closest treasure. My treasure hunter, Gil (axe) was the only weapon I had against the wraiths so he would vanguard for me. After using telekinesis on the treasure, the thief promptly picked it up and got off the map. Gil went over the wall and I didn’t want him alone with the wraiths so I sent a couple of “war” wolves up over as well. In addition, Sean’s forces on my right had started coming over to my side to slow me from reaching the center. I swarmed him with my other treasure hunter, a warhound, and my bear. They ended up routing Sean’s forces, taking down his warhound and archer. A lone thief of his would stay behind to harass me from getting further into the maze. 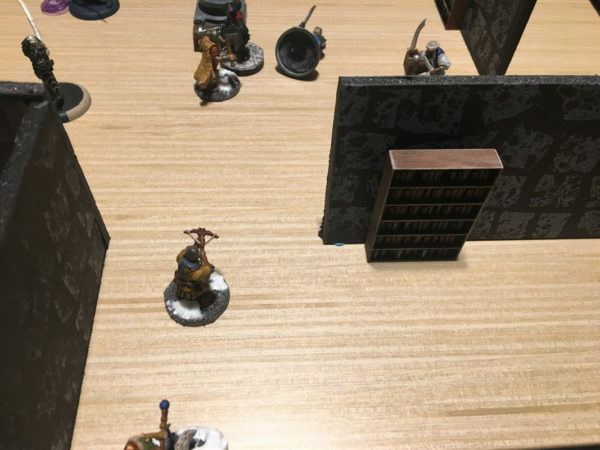 On the otherside, Reese and Colton started to square off with Reese putting both his wizard and apprentice out in the open to deal with some annoying imps. 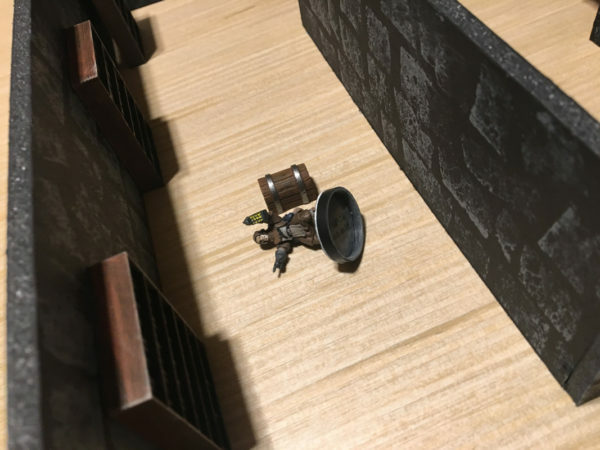 Their main goal was to put up Wizard Eye’s in the main treasure room and then escape back over the wall. Reese also had his forces choke up the lower hall as well to make sure Colton didn’t come around the side and cut him off. With a wraith coming in, I liked my odds. The warwolves would help to make sure Gil had good odds (+8 on the attack) to take down the wraith. Unfortunately, it attacked the wolf first and took him down in one shot. In the following round, Gil would avenge the wolf and bring the wraith down. With most everyone else also clearing out the wraiths, the center became a deadly killzone. Reese had wizard eyes up shooting bone darts at everyone while Sean put up a wizard eye as well and started using telekinesis on the the treasures, pull them to him. My crossbowmen joined in but failed to do anything and then a bone dart wounded him, limiting his use for the rest of the game. 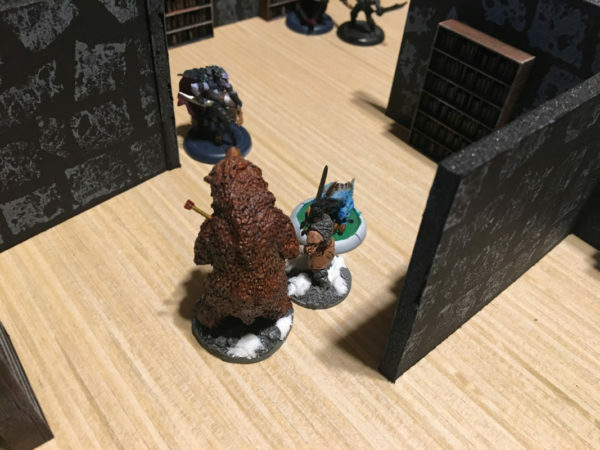 Gil and a wolf took down one of Reese’s henchmen but then the wolf fell soon after. The corner of the map is where Colton saw most of his action. Unfortunately, his Archer quad and imp battalion couldn’t break through Reese’s soldier band. I saw that band routinely block all four archer shots and then follow up and down an imp. With the battle heating up in the center, I brought in my wizard. First she protected herself with Beauty (and a casting value of 20). No one was able to match wills enough engage or shoot her so she sniped one of Reese’s characters. I really wasn’t thinking here as I should have ran her in there and just owned the place grabbing treasures or telekinesis’ing them away from Sean or Reese. Cowardice got the better of me and my wizard stayed more or less muted during the exchanges. Reese and Sean were both able to capitalize and had treasures running out of the room. 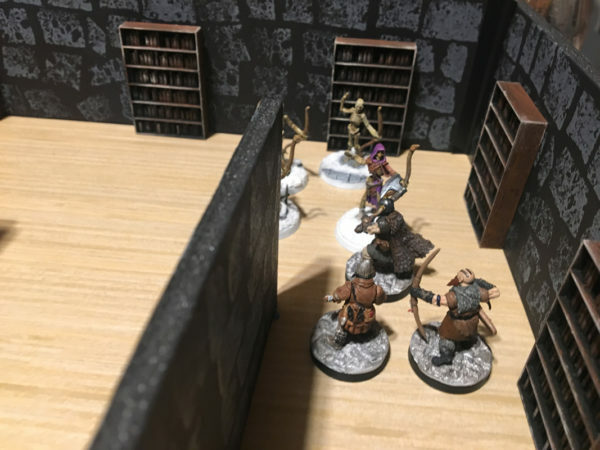 The constant barrage of Bone Darts from the Wizard Eyes took their toll and Gil was forced to retreat instead of engage the treasure bearing soldiers. Colton could only harass Reese with more imps, having never even made it into the center area. Much too late in the game I ran my warhound over to the other side to harass Reese’s bone dart slinging spellcasters. It did not end well. 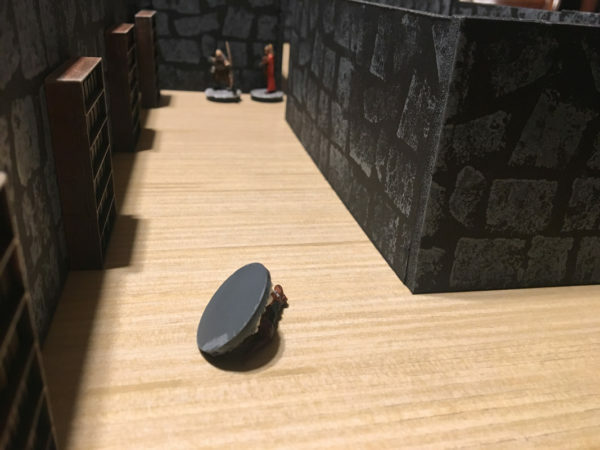 However, time was running out and to get the shot off, Reese’s apprentice cut herself down to wounding and ultimately ended up not making it to the door in time. Lucky for her, she was able to find her way out eventually. Everyone else retreated the rest of their armies off the board save for one straggler bearing treasure for Reese. He was never seen again. I like to think that he did make it out with some amazing treasure haul and decided to keep it all for himself. 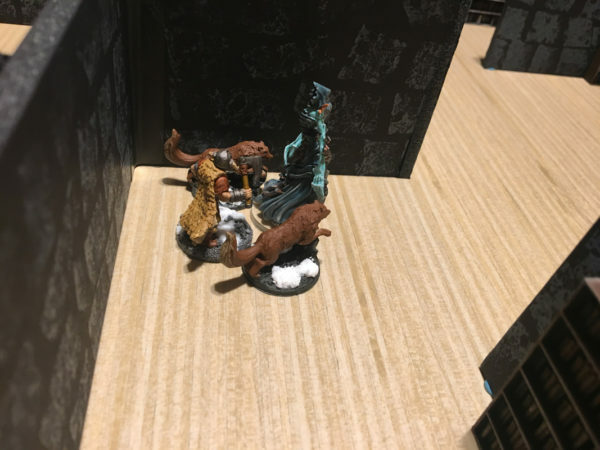 Or maybe he is now one of the long lost souls tormented by the library and driven mad, eventually rising up as a new wraith to guard the ruins anew. It was a fun game and felt quite unique with the maze layout. I had an idea that I wish I had had time to implement and that was to mark the bookcases so that figures could search them for an action. If they revealed something, it would mean gold or scrolls or something cool or deadly. 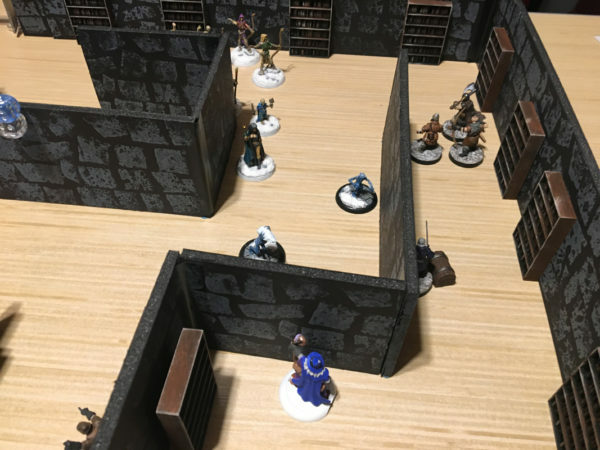 Colton didn’t have a lot of movement or offensive options against wraiths and the maze so that could have helped him do a little more. Ultimately, he ended up the same as me though with one treasure and a level or two for experience. We agreed that we definitely wanted to play the map again with the bookcase search variant but next time will likely be a more standard layout. 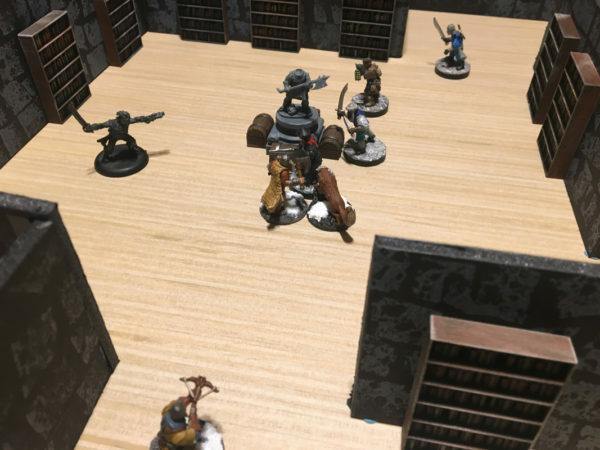 We have some new terrain painted up so we’ll have that all laid out again and ready for session 3 next month.